It’s not what you say, its what people hear! 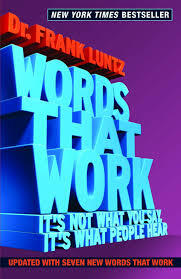 Frank Luntz built a career on figuring out how to use words to evoke certain emotions and reactions out of people. In his book “its not what you say, Its what people hear” he gives numerous examples of his own personal career moments and his own take on advertising slogans and political campaign messages from history. The biggest point of his book is his Ten Rules for Successful communication. “The single greatest challenge for those in the world of politics is the inherent assumption that everyone else knows as much as they do.” (Words That Work) Luntz argues that politicians don’t usually know how to speak in a way that can connect to the average everyday American that is not in tune with the political lingo of Washington. This results in a lot of what the candidates are trying to say to go over the heads of most people. In turn people tend to either vote of loyalty to their respected party, or to vote on who they believed to be the best sounding speaker all the while not actually understanding the full message of what the candidate was trying to say. Luntz uses the argument that you can have the best message possible, but the way that every individual hears the message is strictly dependent upon their own personal experiences and perspectives. If you try to mention something as controversial as abortion a lot of people immediately jump to one side of the argument or the other, they either get defensive and claim that it is murder or they will jump to the other end of the argument and claim that someone can’t understand the position that would require someone to make that decision. Luntz would say that the argument should be presented in a way that requires you to put yourself in the other persons shoes. Now that might seem extremely difficult given the argument, but Luntz would say that a person won’t really hear the message you are trying to say unless you can come from a position that they can relate to. This is the key point that he spends the most time during his book trying to get across along with ways to try and communicate better with people. According to Luntz it is not what we are saying, but how we are being heard. An example he talks about is the political debate of Global Warming, and how it had a wider influence on the public when politicians began referring to it more openly as Climate Change rather than Global Warming because it is something more easily understood by the average person; Global Warming makes you think about the science behind it, but Climate Change says that the weather is changing and that isn’t good. He mentions President George W. Bush’s speeches on the War on Terror. At first the no baking down, hard-nosed attitude approach was what the American people wanted, it was coming off the heels of the biggest terror attack in American history. It was a rare instance where everyone agreed on a single course of action, but as the war drug on and more and more people were losing their faith in the fight Bush’s constant bellowing of not backing out and the enemy doesn’t know who their messing with began to rub thin with a lot of people because the President wasn’t able to understand the view point of the everyday American. Luntz gives plenty of details on how to make communicating with other people easier, as well as giving a list of good and bad ways of advertising and communicating in the business world. Whatever side your looking at it always goes back to his main rules, mostly: Keep it simple and keep it short. The book is loaded with interesting historical facts about the political and advertising world, but it is also a good piece on learning how to better your own communication skills and a book that I think a lot more people could find use out of.